Our most popular aeration systems, the PondSeries™ Aeration Systems are powerful enough to aerate ponds up to 8 acres and can be adapted to fit uniquely shaped ponds for maximum aeration. Diverse PondSeries™ systems make aeration a breeze. Our single plate PS10 system is excellent for smaller or regularly shaped ponds while the 8 plate PS80 tackles larger water bodies up to 8 acres, or ponds with an irregular shape that require precision plate placement for even circulation. All PondSeries™ Systems are designed to aerate pond up to 21′ deep, but can aerate up to 50′ deep when a Deep Water Kit (sold separately) is added. Our attractive composite cabinet houses and protects the SilentAir™ Compressor from outdoor elements. An integrated cooling system utilizes a ventilation fan with rain shroud and high-density air intake pre-filter to distribute air evenly throughout the cabinet keeping the interior components clean, cool and dry. An elevated base protects the aeration hardware and electrical components from flooding and rainwater accumulation while the removable top ensures quick and easy access for inspection and maintenance. Every Airmax® ETL Composite Cabinet in our PondSeries™ is electrical safety certified and comes complete with a pre-wired electrical box and 6 foot power cord to provide power to the enclosed cooling fan and aeration compressor. The Airmax® Composite Cabinet comes with a lifetime warranty on the cabinet and a 2-year warranty on electrical components. The heart and soul of each PondSeries™ Aeration System, our powerful whisper-quiet SilentAir™ rocking piston compressors built with SmartStart™ Technology to protect the compressor during pressurized restarts following power supply interruptions. Each compressor pushes oxygen through your pond while remaining energy efficient – costing as little as $9.27 a month in electricity running 24/7. 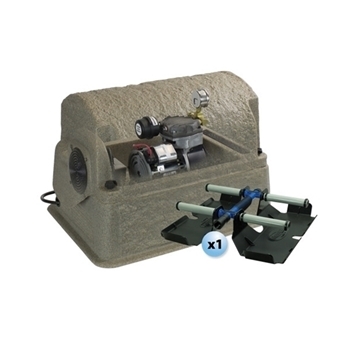 Each SilentAir™ aeration compressor is fitted with an integrated air regulator to provide easy airflow-management and is mounted on vibration reducing rubber feet to ensure quiet operation. Designed for maximum oxygen uptake, our ProAir™4 Weighted Diffuser incorporates high-efficiency low-maintenance membrane sticks to release tiny oxygen bubbles into the water column. Membrane diffusers posses the synergy of air stones without the headaches of cracking and acid-washing. The ProAir™4 Weighted Diffuser has an integrated check valve to prevent back pressure on the compressor. The innovative sled design keeps the ProAir™4 submerged while maintaining an upright position during installation. Comes with a 5-year warranty. Quietest Aeration System on the market. The compressor is rubber-mounted inside a fan-cooled composite cabinet.